with out a doubt, dyson vacuums are the creme de la creme of vacuums. if apple made a vacuum, i'm convinced it would be a dyson. we've been in need of a new cordless vacuum for a while since our old cordless stick vacuum died. we searched all around looking for deals, but didn't find anything we really liked. in no way was i considering a dyson because i know the high price tag on them. we happened to be in lowe's looking at other vacuum options and were ready to walk out in defeat when i glanced over and saw a few dysons on clearance. it was an older model that was going to be replaced by a newer color, so they were significantly marked down. we ran home, cashed in our discover credit card points for lowe's gift cards (you are dumb if you don't take advantage of this by the way), and then went back to lowe's to purchase the vacuum. 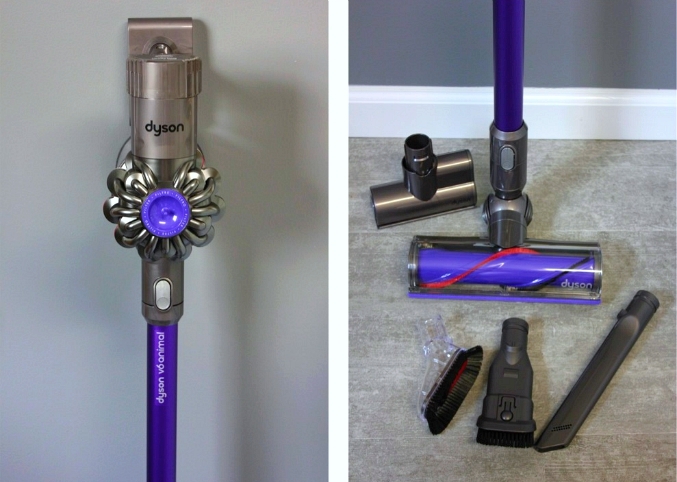 we looked at a few different options and ended up with the dyson v6 animal which is a cordless stick vacuum that converts to a small hand-held vacuum and has a ton of attachments. we walked out of lowe's with this awesome new present for ourselves and paid absolutely nothing for it! that was a fun little christmas present in july! That looks nice. Dyson is supposed to be a good product but expensive. Good thing you were able to get a sale. The test would be to use it on cat hair to see if it really passes the test by picking up the hair. You may try it down here any time. Wow, what a fabulous find! Let us know how it works.